This is the Mercedes-Benz C-class Plug-in Hybrid, available as both a saloon or estate. It will be capable of emitting just 48g/km of CO2, and will be able to achieve up to 134mpg. It will be likely to cost from £45,000. The new C350 Plug-in Hybrid will be aimed primarily at the business and fleet market and our price estimate is based on the fact that the existing C300 Hybrid costs £42,500. Under the bonnet will be a 208bhp 4-cylinder petrol engine that is linked to a 80bhp electric motor. This brings the combined output to 275bhp, but more significantly it is able to call upon a huge 443lb ft of torque, placing the emphasis very much on performance as opposed to eco-friendliness. That mountain of torque means that the C350 Plug-in Hybrid is able to hurtle to 62mph from a standing start in just 5.9 seconds. The battery is able to be used as a single source of power, or in partnership with the engine as an additional boost. All of that power is transferred to the rear wheels via a 7G-Tronic automatic gearbox. If the driver does have pangs of environmental guilt, the C350 is also capable of travelling up to 19 miles in pure electric mode. The battery is able to be charged from a wall-mounted box or a quick-charging public facility in just 105-minutes. The downside is that the boot has been significantly compromised with the saloon’s capacity shrinking by 145-litres to 335-litres. The estate reduces from the standard cars 490-litres to 350-litres. In both instances, the battery pack adds 100kg of additional weight. Nevertheless, Mercedes-Benz are investing heavily in plug-in hybrid technology. The Stuttgart manufacturer is planning ten new models between now and the end of 2017 ensuring that there is a choice of such models across a broad section of its range. Next up will be a plug-in version of its GLE crossover 4x4. As it stands, the C350 Plug-in Hybrid will arrive in the UK from the summer. This is the new generation MINI Clubman. It has just gone on sale, priced from £19,995 and is the third model to attract the marque to more family-orientated customers. Engine emissions range from 109g/km of CO2 for the Cooper D through to 144g/km for the warm Cooper S version. There is even the possibility of a plug-in hybrid model arriving in the future. At 4,253mm in length, with a width of 1,800mm and a wheelbase of 2,670mm, it the company’s largest production model. Those dimensions mean that compared to the model it replaces, it is a significant 270mm longer and 73mm wider than the outgoing Clubman, proof of the company’s ambition to move the model up into a higher class than it previously occupied. Underpinning the new Clubman is BMW’s UKL1 platform. This is the same platform that is utilised in the MINI hatchback, as well as the BMW 2-series Active and Gran Tourer. This growth means that the new Clubman will be looking to compete with the Volkswagen Golf. In addition to the vast growth spurt, the other significant difference between the current and previous generation Clubman models is its layout. Whereas the old model has a quirky ‘Clubdoor’ on the off-side of the vehicle and a single on the driver’s side, this unpractical arrangement has been ditched in favour of a more traditional two doors on each side. 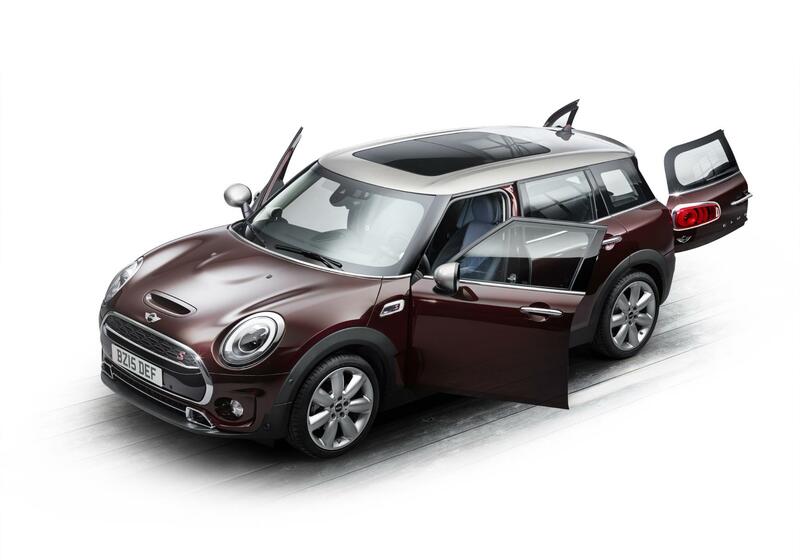 However, the retro-inspired twin ‘barn’ doors have been retained instead of adopting a traditional hatchback, harking back to the 1960s Morris Mini Traveller and Austin Mini Countryman. Engines include a 134bhp 1.5-litre, three-cylinder petrol unit. It is capable of accelerating to 62mph from a standing start in 9.1-seconds before going on to top out at 127mph. It returns up to 55.4mpg on the combined cycle and emits 118g/km of CO2. Diesel fans will be able to go for the Cooper D which will be powered by a 148bhp four-cylinder 2.0-litre diesel unit. Costing from £22,265, it returns up to 68.9mpg on the combined cycle but emits just 109g/km of CO2. Despite its efficiency, it is no slouch, hauling the Clubman to 62mph in just 8.6-seconds and topping out at 132mph. The hottest £22,755 Cooper S version uses a 189bhp 2.0-litre four-cylinder petrol unit. It can accomplish the benchmark 0-62mph sprint in 7.2-seconds and reaches a maximum speed of 142mph whilst emitting 144g/km of CO2, balanced against a combined fuel consumption figure of 45.6mpg. A warmed-up diesel version will also follow, in the shape of a 168bhp 2.0-litre turbocharged diesel unit which will be used in the SD Clubman. BMW/MINI insiders also hint that a three-cylinder petrol engine mated to a plug-in hybrid system could feature in a future line-up. Inside, there is a unique design for the air conditioning controls. As a mark of its maturity, the dashboard wraps around to the doors. Traditionalists will be pleased that MINI have kept the circular central instrument binnacle which can feature 6.5- or 8.8-inch touchscreens. The seats contain a memory function as standard. Electrically adjustable seats are on the options list. As is common with the MINI brand, there are a multitude of different trim and upholstery choices. 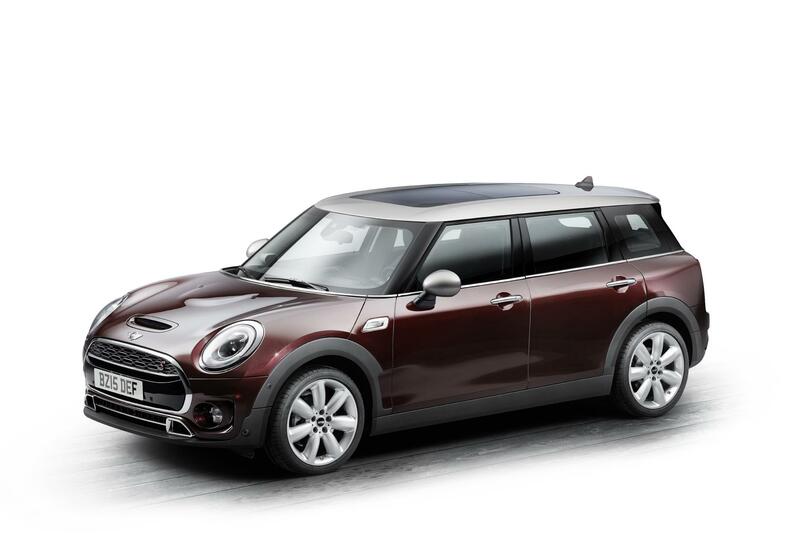 Buyers can also purchase the MINI Excitement Pack which includes customisable interior ambient lighting and the MINI logo projected on the ground from the driver’s door mirror. The company is forecasting that half of all Clubman buyers will opt for the £2,875 Chili pack. It contains kit such as heated sports seats with cloth/leather upholstery, Comfort Access (which includes the ability for you to access the boot by waving your foot under the bumper), park distance control, automatic air conditioning, and LED headlights and fog lights. Access the boot via the novel rear doors and you will have up to 360-litres of capacity to use when all the seats are in use. This can be increased to 1,250-litres if you fold the second row, or if you don’t need all the space, it can tumble 60:40 with the option of 40:20:40 if required. An optional Storage Pack improves usability by featuring a variable boot floor, additional storage, tie-down points, cargo nets and seat-backs which can be set to a 90-degree position. Find more hybrid cars for sale here.